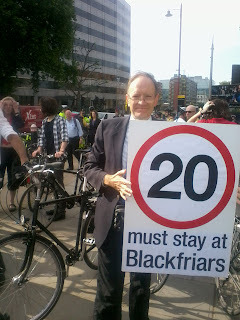 There's an important debate and vote on retaining the 20mph limit on Blackfriars Bridge, rather than making the limit 30mph as currently planned by TfL, in the London Assembly next week, on Friday 8 June 2011, when Assembly members will vote on a formal motion. 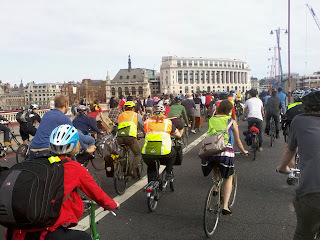 The bridges are key to making London a pleasant place to walk and cycle around. Get a free basic check-up for your bicycle courtesy of Lambeth's sustainable travel team this Wed 1 June between 5.30 and 7.30pm. The event is held in the piazza outside the King's College's James Clerk Maxwell building next to BFI IMAX by Stamford Street . 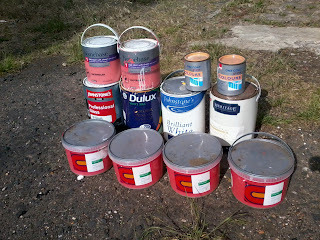 I then took multiple tins of paints out of the skip at the allotments and brought them home to decorate our house with. 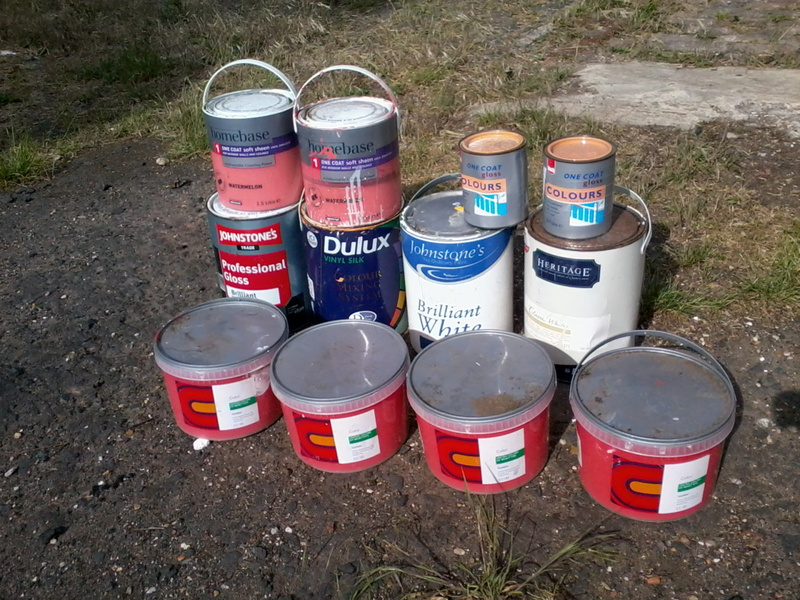 Most of the stuff in the two skips could be reused in the local area as straightforwardly as I did with the wood and the paint (and a splendid TV and an unused laundry basket we now happily own). At the risk of sounding churlish given the quality of the stuff we've taken from these skips, it would be much better if people offered stuff to their neighbours, put it on Freecycle or gave it to a charity shop thus negating the need for a skip or reducing the frequency of their use. After all, skip lorries are amongst the noisiest and most dangerous vehicles on our streets - never mind the wastefulness and danger involved in making and transporting new products when existing ones can so easily be reused. 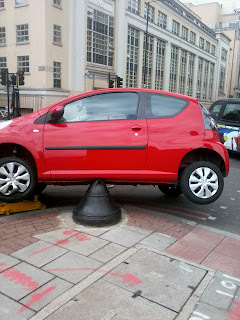 I wonder whether this driver will be required to have a medical check and driving retest? 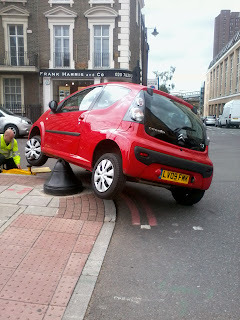 I saw this today on Cornwall Road (London Cycle Network Route 3) at the junction with Stamford Street. The primary school children I was teaching safe on-road cycling to weren't impressed. And, for the record, they all considered Upper Ground, where they were to turn right into Cornwall Road, to be a very hostile cycling environment. That'll be one of those Olympic Cycling Greenways / National Cycle Networks - stuffed full of big lorries, big buses and belching taxis. For the past year there's been a Pedal Power Kennington workshop space at the former Lilian Baylis school in Lollard Street, thanks to the enthusiasm of pupils at the current Lilian Baylis School and funding from TfL. A lot of 10-16 year olds have, by and large, had a great time there. 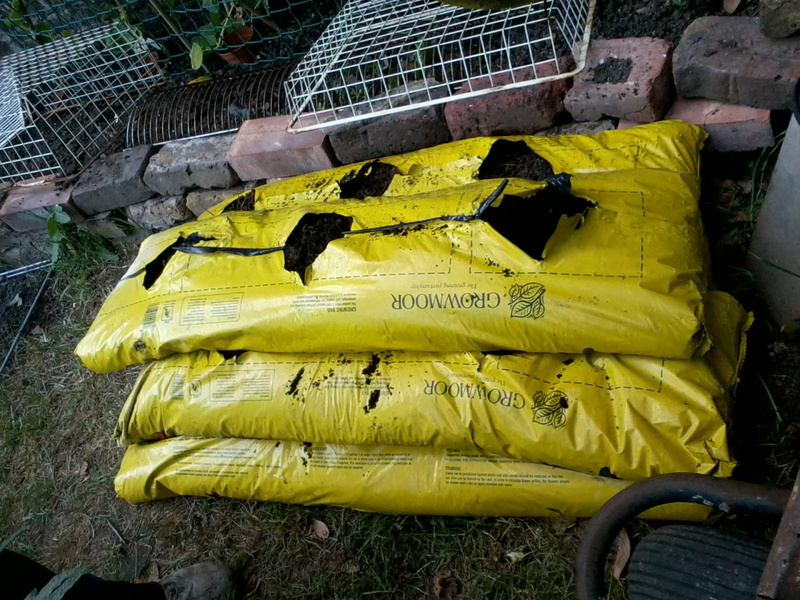 The same goes for those adults involved with the project. The site is now scheduled to be sold by Lambeth and the Sports Action Zone have relinquished the lease on the site. So what's the best way forward? Having a dedicated space offers a degree of freedom. It's a 'known' space - it's for working on bikes. It's a 'safe' space. There are a couple of adults around to mediate when issues arise. 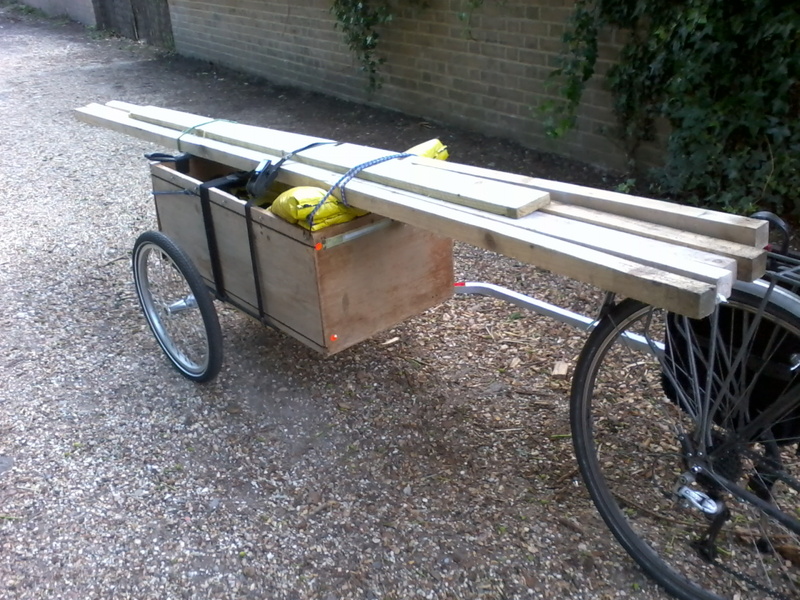 It's a storage space too, with all kinds of bits and pieces to hand. But it's also a millstone. I've felt kind of guilty about having such a space in use for only a few hours each week, plus the onus to pay rent on the space. 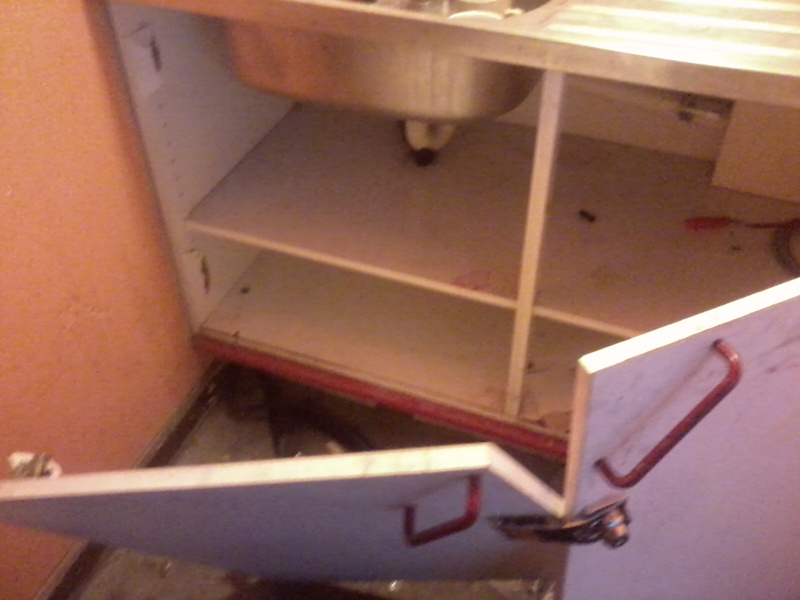 And there's always the question of when it'll be broken into. 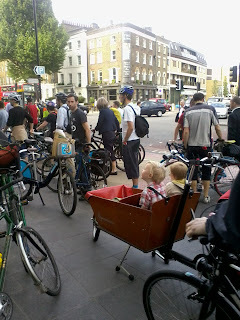 But perhaps the biggest question is whether it's the best place to put effort if getting more people cycling is the intent. A group of young people have had a great time over the past year, learnt some stuff, cycled more - and at least 100 bikes have been given away to them. But compared with how many could have been reached by workshops in schools or youth clubs......? 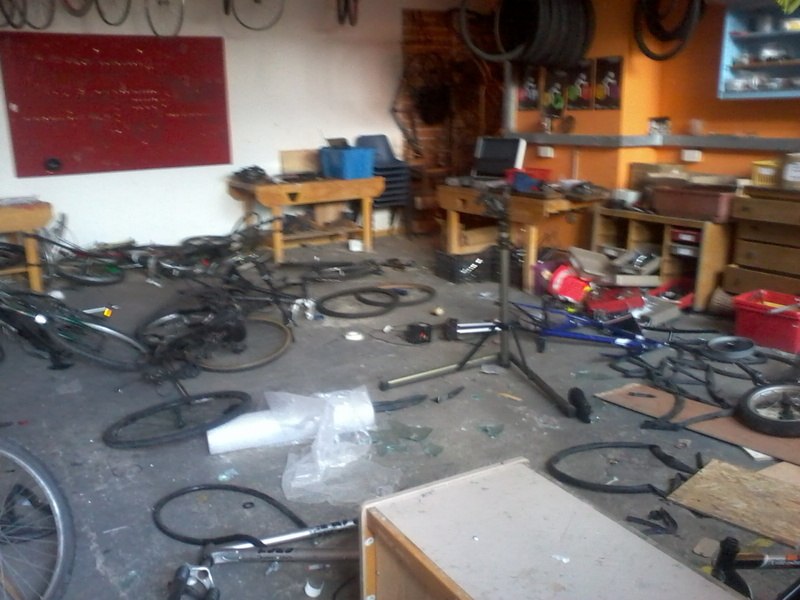 It's time to bid for some more funding, and firm up plans for next year, and at the beginning of this week the room was broken into, a couple of bikes, various parts and most of the small tools stolen. Luckily a few bikes were off site and a few beat the efforts of the thieves to break the locks holding them. It's time to reflect. 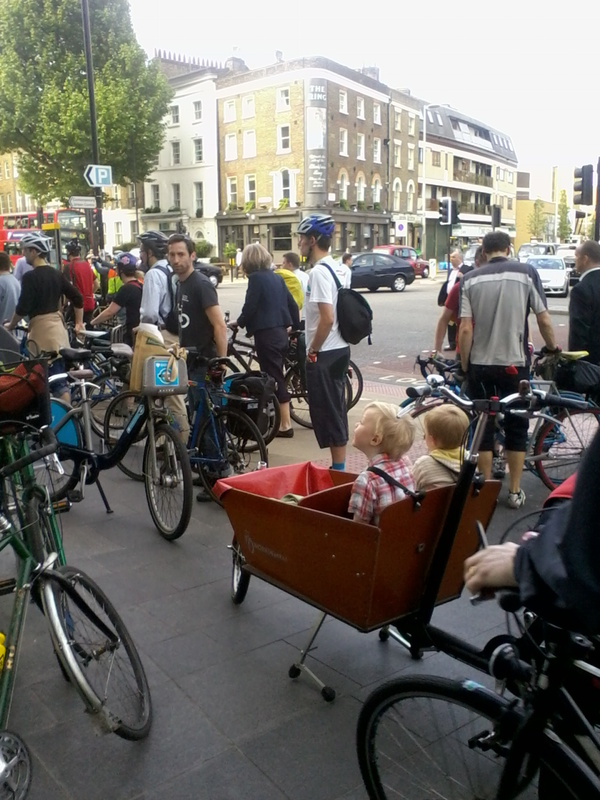 Maybe it's time to move to a more peripatetic Pedal Power Kennington. 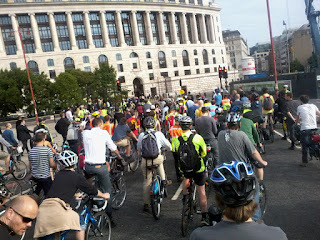 Rather than have a hub, let's move from site to site, school to school, youth club to youth club, street to street. More travelling circus than bricks and mortar theatre. 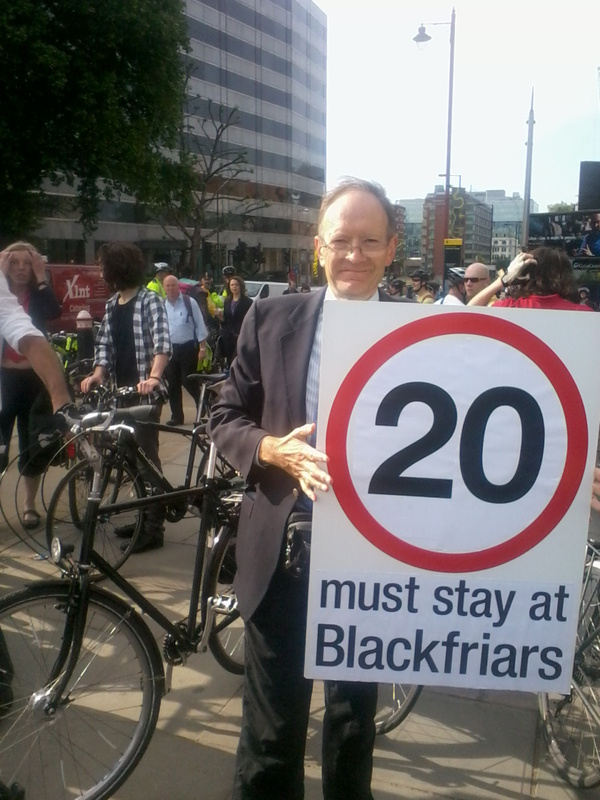 I don't believe it will stop us from being able to give bikes to the community or provide oppotunities for people to learn cycle maintenance, but it will allow more people to be reached and a greater concentration on riding bikes rather than spannering them! But then I'm a little biased as circus rather than theatre is in my blood. How will it play out? Don't know, let's see as the grant application is drafted. 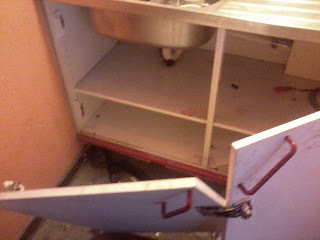 Meanwhile, here are some photos of the space post break-in (thanks to Karim, Mohamet and Simon for helping secure the space subsequently). This Friday morning (tomorrow!) 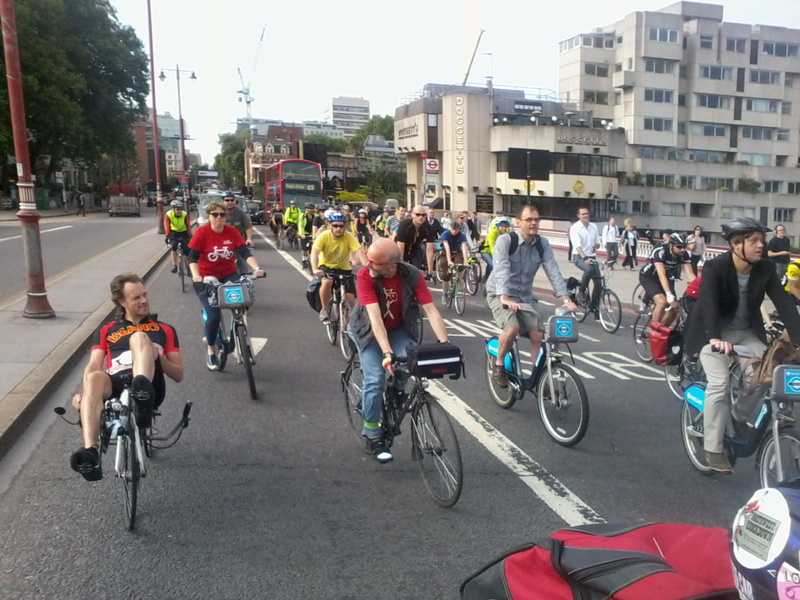 London Cycling Campaign report there'll be a Flashride over Blackfriars Bridge - meet at 8.30am by Doggett's Pub on the southside of the bridge. 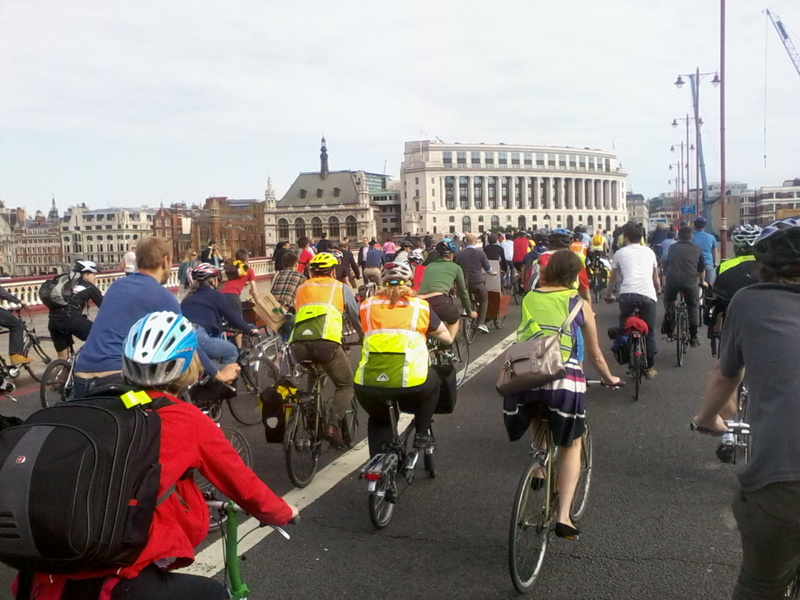 London's bridges are going to be core to the future of cycling in London. Currently they're dismal to approach and ride across. 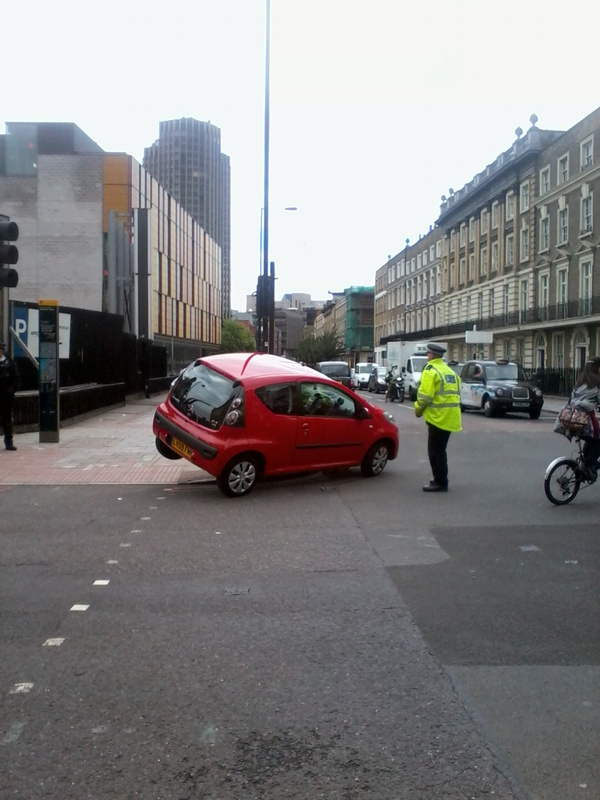 Under Boris's regimeTfL are mucking around at the edges rather than dealing wholeheartedly with the motor traffic sick centre of London. It's time for pedestrians and cyclists alike to reject motorway style urban planning for the Capital's core and force a move towards non-polluting, slow, quiet, clean and healthy travel. It's time to mobilise! See you tomorrow. 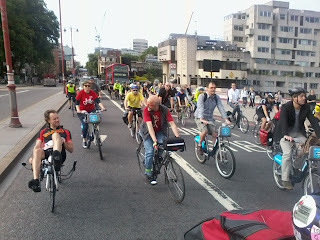 First Blackfriars then Waterloo, Westminster, Lambeth and Vauxhall. Tomorrow evening the South Bank Forum features an update on Network Rail's £10 million project to create 18 new shops on a balcony at Waterloo Station. According to Network Rail, 70% of all rail users either start or finish their journey in London giving an exquisite opportunity to make filthy great profits from flogging bottled water, shiny paperbacks and the like, brought in by the congesting, noisy, stinking, lorryload. The opportunity to grossly rack up the profits at the cost of the environment is enhanced if you ensure your stations don't have drinking water fountains or taps for refilling your water bottles, charity shops or libraries. We're committed to reducing our environmental impact throughout the infrastructure that we own and operate. Encouraging people to use the railways. Why not ask whether there'll be prominently positioned water taps in the newly refurbished station at the meeting tomorrow night. An interesting report can be found here with the linked PDF well worth a read. On 6th April 2011, members of Elephant Amenity Network and Southwark Living Streets took folks from Southwark Council, Make Architects and Heygate site developers Lend Lease for an extensive walk around the Heygate footprint site. The walkabout was organised to look at the quality of current walking and cycling routes into the Heygate and Elephant & Castle from the surrounding area and to assess the potential for new routes to be created. The focus was principally on the routes south of the E&C Shopping Centre.